Every 11 July since 1995, thousands of people gather in Potočari to commemorate the Srebrenica genocide, the most horrific crime committed in Europe since WWII. Survivors and victims’ families demand justice, recognition and respect. In a few days of that July of twenty-three years ago, more than 8,000 boys and men were systematically and brutally executed, and 30 000 people violently displaced. Since then, the relatives of the victims - and in particular mothers who have lost husbands, sons, brothers - have started a long, courageous walk to justice and recognition. Along that way, they have found some measure of them. The International Criminal Tribunal for the former Yugoslavia has determined that genocide was committed in Srebrenica and convicted some of the war criminals that orchestrated and took part in it. And grass-root organisations are overcoming great obstacles to start the difficult journey to reconciliation. All this carries a strong significance, but remains little consolation for the survivors of the genocide and the victims’ families. They demand that their loved ones be found, but the slow identification process inflicts them additional suffering. They demand health care to treat their trauma, and they get substandard care. They demand accountability, but many war criminals are still free and unpunished. They demand recognition, but their suffering is ignored, vilified or denied. The latter is certainly one of the most outrageous offenses that they have been obliged to endure during the post-genocide period. And yet, they have found the strength to continue their fight for the truth and justice, despite the denial and minimisation of the genocide, which we see also happening in education. Mono-ethnic schools and the “two-schools-under-one-roof” system still characterises education in Bosnia and Herzegovina. It is also characterised by the ignorance of the past and manipulation of the facts about the recent war. Such a situation perpetuates the ethnic divisions which made current and past tensions possible and hinder reconciliation and peace. We must reverse it. 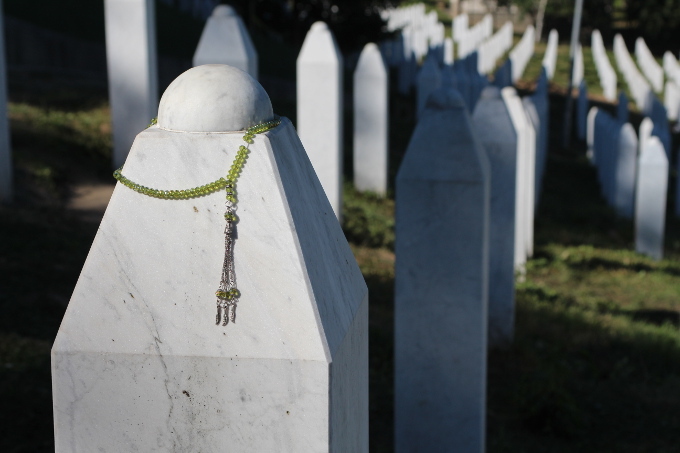 Survivors of the Srebrenica genocide must receive adequate social protection and improved legal assistance to assert their rights and obtain reparation. Political and judicial authorities in Bosnia and Herzegovina and in Serbia must improve their cooperation to end impunity, by identifying and punishing war criminals. They should also invest more in identifying all genocide victims and clarify the fate of those who remain missing. They must step up the search for mass graves and ensure that witnesses who may disclose the information necessary to identify all the other places where corpses have been buried feel safe to do so. Governments and decision makers must adopt farsighted policies that establish accountability and focus on education. This must become a shared responsibility, primarily for Bosnia and Herzegovina and Serbia, but also for other European countries, not only in the former Yugoslavia. The education systems in the region, must become more inclusive. They must lead the young generations out of the caves of prejudice in which manufactured realities blur the truth and spread the seed of hate. School books, not only in Serbia and Bosnia and Herzegovina, but all over Europe, must include an objective testimony of the past atrocities, including the Srebrenica genocide, portraying it without political or ethnic connotations. They must educate about the past, educate to debunk myths, educate about justice and equality for all. European countries should provide more support to grass-root initiatives for reconciliation. They should also put more pressure on politicians and other public figures in Serbia and Bosnia and Herzegovina to stop denying the past and to build more inclusive education systems and societies. Like the Holocaust and the Rwanda genocide, the Srebrenica genocide was not an accident. It began well before it occurred. It started when human beings were singled out because of their ethnicity. It grew with a public discourse, fomented by some media, which dehumanised them and marginalised critical voices. It took shape in the systematic and industrial extermination of a large group of people, under the eyes of a passive international community. And it continues today, with denial and impunity. The Srebrenica genocide marked one of the darkest pages of European history. If we want to write a brighter future, we must remember what happened and treat all the victims as our victims, without political nor ethnical connotations. We must acknowledge the suffering of the survivors and of the victims’ families. We must make their struggle for justice our goal. As Commissioner for Human Rights I will continue calling for justice for all the victims of the crimes happened during the wars in the Balkans. Serving justice is the only way we can all confront the past and prevent that it repeats itself.